William A. “Bill” Wood was born on October 6, 1929, at Lost River, West Virginia. He attended Mathias High School and West Virginia University and served in the United States Marine Corps during the Korean Conflict. In 1952 he married Edna Barbe. They have one daughter, Robin Stultz; a granddaughter, Amelia Wagner, and one great-granddaughter, Morgan. They also have a foster daughter, Tracy Perdue. Bill taught school in Hardy County, West Virginia, for two years and was Business Officer for four years. He was employed by Hester Industries, Inc from 1959-1999. He and his wife, Edna owned and operated Woods Edge Restaurant and Motel for 15 years. Brother Wood has been a member of the Lions and Ruritan Clubs, a 4-H Leader, as well as the President of the Moorefield Elementary School PTA and Moorefield High School PTO. He has served as a member of the Board of Directors of Hardy Telephone Company, Chairman of the Hardy County Democrat Executive Committee, part-time Justice of the Peace and Magistrate, and President of the Potomac Highlands Guild. Through his involvement with the Board of Directors of the Potomac Highlands Guild, he helps mentally, physically, and emotionally charged individuals in a five county area. He is an Elder in the Ivanhoe Presbyterian Church. Bill served as Commander of the William Sprigg Hamilton Province from 2008-2009. 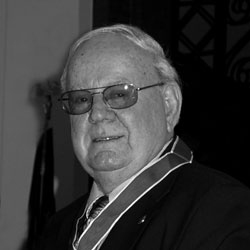 He is the recipient of the Knight Commander’s Accolade, a member of the Hamilton Court of Honor and the James Ward Wood Province Court of Honor. As James Ward Wood’s grandson, Bill Wood remains our living link to the principle founder of Kappa Alpha Order. Please click here to watch Brother Wood’s address at the 13th Leadership Lecture Luncheon, held at the 74th Convention, in Phoenix, Arizona.